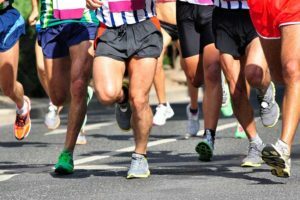 All runners need remedial massage, whether you are a beginner, preparing for a personal sporting challenge or an elite athlete, training for such events as the Melbourne Marathon, iron-man, athletics, cross country or even the casual park run enthusiast. We all need to ensure our bodies are well maintained machines to maximize our potential and stay injury free. Why do you need remedial massage? Injury prevention “fix injury before it happens"
Consistency in training is essential for runners to perform their best. Energy expenditure during running must be spent wisely to ensure maximum efficiency. So my job is to ensure the right muscles are doing their job properly and have the physical ability to function. If your gait isn't correct here is an eye opener for you. Say you are running 90 steps per minute per leg, in an hour that is 5400 steps per leg per hour. With your biomechanics not in line niggles come on pretty fast and you could be spending more energy than you need, overall becoming prone to injury and not reaching your maximum potential. Runners are time poor, and usually plan their sessions on a weekly basis. Most runners train (gym and run) between 5-10+ times usually with a recovery day once or twice a week. My question is, how many recovery 'training sessions' are in your calendar? Most will either have minimal to none, and I am guilty of doing this in the past. By scheduling recovery 'training sessions' into your weekly routine is a great way to motivate and find time to look after your muscles, overall increasing performance and preventing any niggles in the future. Everyone has a different style of running and depending on the individual's biomechanics I can assess and provide specific recovery 'training sessions' to suit you. Eventually we want to be doing 50% training with 50% recovery, and this can be done by including the recovery sessions with your gym sessions, booking a remedial massage or yoga/ Pilates class to force you to make the commitment each week. To book an appointment at our Melbourne clinic or to find out more about how remedial massage therapy can help your stubborn sports injury or boost your exercise program, call us today on (03) 9863 7011. It's also easy to book a massage online by filling in the form on the left.